I admit the chances are slim that No Child Left Behind will not be reauthorized, but the Educator Roundtable has a petition calling for just that. If you would like to sign the petition, go here. 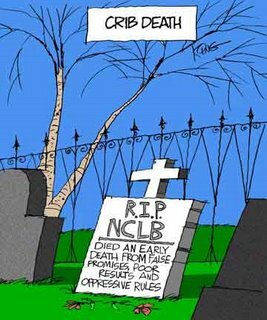 If you are not sure it is flawed legislation, go to the site and read 16 reasons for dumping NCLB. If you have lost track of Richard Dreyfuss since “Jaws,” you will be suprised to learn (as I was) that he is currently a senior advisor at Oxford University. This clip from Bill Maher’s “Politically Incorrect” makes a point about the lack of civics education that is, I think, exactly right. Gore Vidal is a national treasure. Now over 80, he continues to act as America’s conscience. Vidal is an internationally acclaimed author of scores of novels, plays, screenplays, essays. An outspoken political activist, he ran for the U.S. House in New York in 1960 and in the 1982 senatorial primary. In 1993, he won the National Book Award for his collection of essays, United States. His recent books (he calls them pamphlets) -Perpetual War for Perpetual Peace, Dreaming War, and Imperial America- have sold in huge numbers. For a look at his remarkable career, start here. He was recently interviewed by David Barsamian for The Progressive Magazine. Below are some excerpts from the essay. Q: In 2002, long before Bush’s current travails, you wrote, “Mark my words, he will leave office the most unpopular President in history.” How did you know that then? 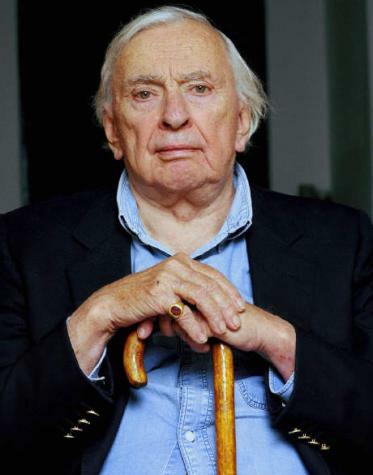 Gore Vidal: I know these people. I don’t say that as though I know them personally. I know the types. I was brought up in Washington. When you are brought up in a zoo, you know what’s going on in the monkey house. You see a couple of monkeys loose and one is President and one is Vice President, you know it’s trouble. Monkeys make trouble. Q: Bush’s ratings have been at personal lows. Cheney has had an 18 percent approval rating. Vidal: Well, he deserves it. Q: Yet the wars go on. It’s almost as if the people don’t matter. Vidal: The people don’t matter to this gang. They pay no attention. They think in totalitarian terms. They’ve got the troops. They’ve got the army. They’ve got Congress. They’ve got the judiciary. Why should they worry? Let the chattering classes chatter. Bush is a thug. I think there is something really wrong with him. Q: What do you think of the conspiracy theories about September 11? Vidal: I’m willing to believe practically any mischief on the part of the Bush people. No, I don’t think they did it, as some conspiracy people think. Why? Because it was too intelligently done. This is beyond the competence of Bush and Cheney and Rumsfeld. They couldn’t pull off a caper like 9/11. They are too clumsy. Q: Today the United States is fighting two wars, one in Afghanistan and one in Iraq, and is now threatening to launch a third one on Iran. What is it going to take to stop the Bush onslaught? Vidal: Economic collapse. We are too deeply in debt. We can’t service the debt, or so my financial friends tell me, that’s paying the interest on the Treasury bonds, particularly to the foreign countries that have been financing us. I think the Chinese will say the hell with you and pull their money out of the United States. That’s the end of our wars. Q: You’re a veteran of World War II, the so-called good war. Would you recommend to a young person a career in the armed forces in the United States? Vidal: No, but I would suggest Canada or New Zealand as a possible place to go until we are rid of our warmongers. We’ve never had a government like this. The United States has done wicked things in the past to other countries but never on such a scale and never in such an existentialist way. It’s as though we are evil. We strike first. We’ll destroy you. This is an eternal war against terrorism. It’s like a war against dandruff. There’s no such thing as a war against terrorism. It’s idiotic. These are slogans. These are lies. It’s advertising, which is the only art form we ever invented and developed. But our media has collapsed. They’ve questioned no one. One of the reasons Bush and Cheney are so daring is that they know there’s nobody to stop them. Nobody is going to write a story that says this is not a war, only Congress can declare war. And you can only have a war with another country. You can’t have a war with bad temper or a war against paranoids. Nothing makes any sense, and the people are getting very confused. The people are not stupid, but they are totally misinformed. Q: You’ve called the country “The United States of Amnesia.” Is this something in our genes? Vidal: No, it’s something in our rulers. They don’t want us to know anything. When you’ve got a press like we have, you no longer have an informed citizenry. Q: When were the media better? Vidal: They’ve never been much good. They belong to the people who own them. But they were better, the level was higher. There used to be foreign correspondents in other countries. There’s nobody abroad now. The New York Times gave up being anything except a kind of shadow of The Wall Street Journal. The Washington Post is the court circular. What has the emperor done today? And who will be the under-assistant of the secretary of agriculture? As though these things mattered. Q: What do you think of the public advertising of one’s faith among political leaders? They make a show of going to church and participating in ceremonies. Vidal: Personally I find it sickening, and very much against what our Founders had in mind. Remember that the country was mostly founded by Brits, and England’s always gotten credit for having invented hypocrisy. So we are reflecting our British heritage when we hypocritically talk about how religious we are. Q: Talk about the role of the opposition party, the Democrats. Vidal: It isn’t an opposition party. I have been saying for the last thousand years that the United States has only one party—the property party. It’s the party of big corporations, the party of money. It has two right wings; one is Democrat and the other is Republican. Q: What can people do to energize democracy? Vidal: The tactic would be to go after smaller offices, state by state, school board, sheriff, state legislatures. You can turn them around and that doesn’t take much of anything. Take back everything at the grassroots, starting with state legislatures. That’s what Madison always said. I’d like to see a revival of state legislatures, in which I am a true Jeffersonian. Q: Do you see any developments on the horizon that might suggest an alternative? Vidal: Newton’s Third Law. I hope that law is still working. American laws don’t work, but at least the laws of physics might work. And the Third Law is: There is no action without reaction. There should be a great deal of reaction to the total incompetence of this Administration. It’s going to take two or three generations to recover what we had as of twenty years ago. I haven’t posted since the election. One reason is because work has been quite hectic. But, I think the real reason is post- election depression. Not on the national level. Nationally, the mid-terms reaffirmed my faith in the good sense of the people. The results here in Idaho, however, the reddest of the red states, and Canyon County, the reddest in Idaho, left me a bit stunned. I have lived here long enough not to have been seduced by the polls showing Grant and Brady as leading in their respective races, but I was. I am better now. I have regained my sanity and my sense of humor. Which leads me to one of the funniest after-election analyses I have read. It is by Bruce Reed on State.com. Go here and laugh to keep from crying. Thanks to Keith, Fred and Vicki for directing me to the article!